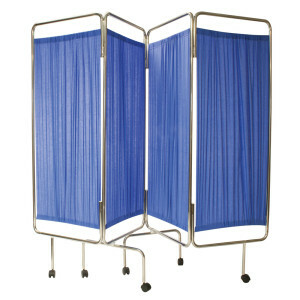 Purchase 50 or more Medical Screen - Four Fold Curtained Designs and download your free support pack worth £100. Purchase 200 or more Medical Screen - Four Fold Curtained Designs and you can have personalised covers absolutely free! Patient privacy is a paramount concern which can be addressed simply and economically with this four-fold portable screen. When not in use it takes up minimum floor space, but when required, opens in seconds to allow an section of a first aid room, GP surgery, clinic, or treatment centre to be screened off. This allows patients the comfort and privacy to remove garments prior to examination or treatment, with discretion.